BERLIN- Stephen Decatur varsity wrestler Anya Knappenberger won the school’s first-ever girls’ state wrestling championship last week, sweeping three matches to claim the title. 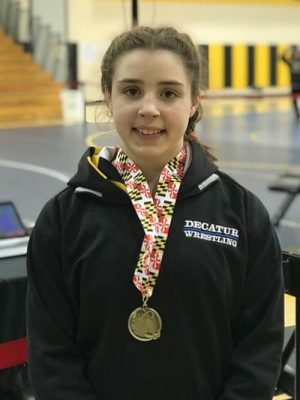 Knappenberger, who battles week in and week out on the unbeaten Decatur varsity team, got her moment in the sun last weekend when she won the girls’ state championship at 112, the first-ever state title for a female wrestler from the school. Knappenberger swept three matches and didn’t give up a single point on her way to the title. After a first-round bye, Knappenberger beat Skylar Beard of Woodlawn and Caitlin Johnson of Carver Center to reach the finals. In the championship match, Knappenberger beat Nina Small of Fairmont Heights. Knappenberger is a key wrestler on Decatur’s highly-successful varsity wrestling team.